There are villains… and then there are super villains. When it comes to the world of slasher movies, most villains are just two-bit cutouts running around with sharp objects. They serve their purpose for the movie, which is slicing up as many screaming teenagers as possible, but honestly, they’re kind of… boring. But there’s one slasher villain who stands heads and shoulders above the rest: Freddy Kruger. 1. Sucking a kid into a waterbed and drowning him. 2. Bringing gym equipment to life to attack someone. 3. Turning a kid into a cockroach. 4. Fusing a guy into his motorcycle. 5. Tampering with a kid’s hearing aid until his head explodes. These are just a few of the creative ways Freddy has killed kids in the past. We’ve got to admit, they’re works of art—leaps ahead of some dumb hulk hiding behind a hockey mask. If you want to dress up like a real villain for your next costume party, this is the guy to be. And we’ve got the perfect outfit: the Freddy Sweater with Burned Flesh Adult Costume. 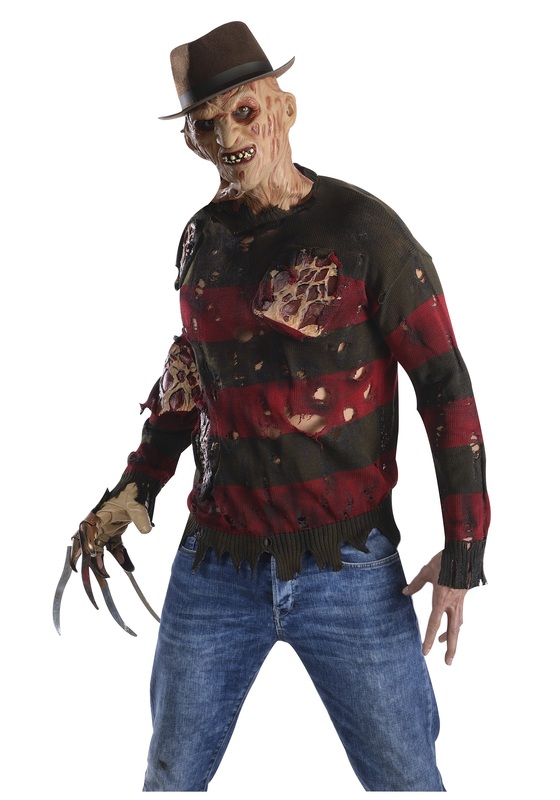 It includes Freddy’s iconic green-and-red striped acrylic sweat, complete with authentic-looking burned spots and attached faux flesh for a real crispy feel. The mask, glove and hat are not included, so be sure to pick those up to complete the outfit. Then you’ll be ready to haunt the dreams of teenagers everywhere!